“Let me tell you the real story,” Mario Batali says in the barrel room of Eataly Boston’s newest restaurant, Terra — and when the noted chef and TV personality speaks, people tend to listen. Batali has just finished explaining Terra’s grill-centric menu to some food bloggers and Instagrammers when a reporter pulls him aside to ask about the increasing tendency of his restaurants to feature beer. “My grandfather Leon was a hop farmer in Yakima,” says Batali. “I grew up surrounded by beer. Our cocktails when I was growing up were beer cocktails, long before they were cool and on tasting menus. Batali says beer in his blood, but he’s less sure on the specifics of Terra’s new beer program, in part because it’s complicated. For New York’s Eataly outpost, Batali partnered with Dogfish Head and Baladin on a rooftop beer garden and brewery. There was no logistical way to shoehorn a brewery into Eataly Boston, so instead, beer from those brewers as well as Cambridge Brewing Co. (and soon Trillium) arrives at the Prudential Center already brewed. 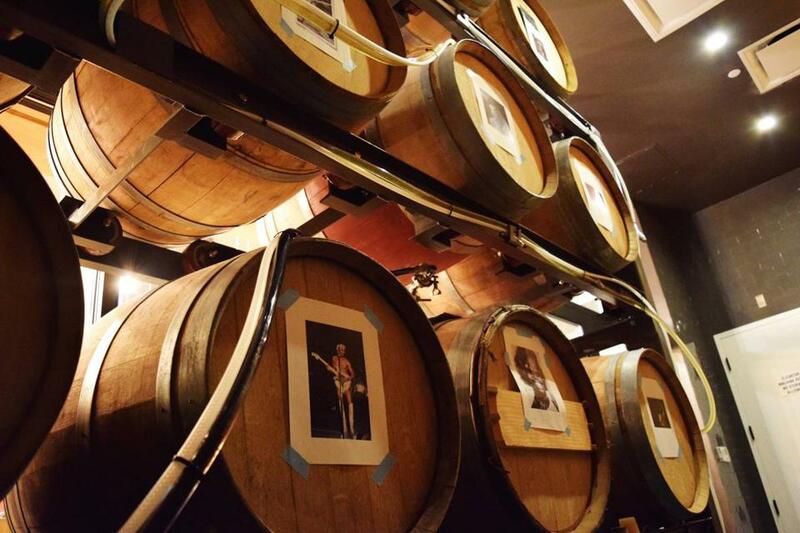 Once at Terra, beer director John McKusick matches each beer with a wine barrel: “Bootsy” is the name he’s given to Dogfish Head’s Siracusa Nera stout aging in a Ca’ Del Bosco Pinot Bianco barrel, while “Maceo” refers to Cambridge Brewing’s Brett Conspiracy soaking up Brandini Barbera. McKusick is happy to get into the tech specs of what happens next, but the headline is that Terra’s tap lines run directly from the barrels to the bar, where McKusick can adjust nitrogen and carbon dioxide levels for a better drinking experience. Because you’re drinking from the barrel, the beer is living, subject to the vagaries of microbes and other conditions that directly affect flavor. Terra’s first two beers are pouring beautifully. “Bootsy” is a marshmallow-y chocolate stout with an ashy, oaky finish McKusick says is the white wine barrel’s contribution. “Maceo” is an approachable sour tasting of funky pineapple. “This one should get funkier and funkier,” says McKusick, who doesn’t know what the beer will taste like in a week. He’s just sure it will be different.